My name is Steve Ryan and I’m a former A-Fib patient. I found my cure. So can you! That’s why I wrote my book, to help you and other A-Fib patients. 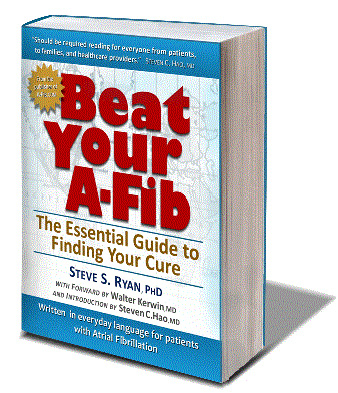 “Beat Your A-Fib: The Essential Guide to Finding Your Cure” is based on my personal experience searching for own my cure, and over ten years of helping other A-Fib patients through my non-profit website, Atrial Fibrillation: Resources for Patients. My book is written in everyday language for newly diagnosed patients and their families, as well as for patients who doesn't want to wade through medical texts and research journals to understand their disease. "Beat Your A-Fib" helps you go beyond the common drug therapies that only manage the disease, but does not cure it. My book helps you find your cure, just like I did. Learn all about Beat Your A-Fib: The Essential Guide to Finding Your Cure. Thank you for visiting our website. I'm very hopeful that you can find relief from the burden of your Atrial Fibrillation. Wishing you good heart health!